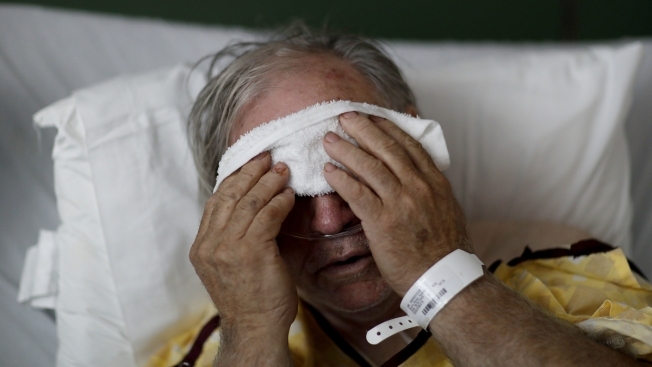 This Feb. 9, 2018, file photo shows a man place a cold compress on his forehead while battling the flu at Upson Regional Medical Center in Thomaston, Ga.
A pill that is touted to help rein in flu symptoms with a single dose is getting a speedy review from the Food and Drug Administration, NBC News reported. The pill's manufacturer, Genentech, said Tuesday that the FDA granted a priority review to baloxavir marboxil, with approval possible by the end of the year. Flu viruses have long been resistant to the first two antiviral flu drugs, and a new flu drug hasn't hit the U.S. market in years. This drug, already approved in Japan, helps stop viruses replicating earlier in the process than drugs like Tamiflu and is "going to be more convenient ... because it works after a single dose," Genentech vice president Mark Eisner said. A severe flu season blanketing the United States is overburdening hospitals and emergency rooms across the country. Many doctors are urging people to make virtual appointments instead, where patients can be diagnosed through video sessions.